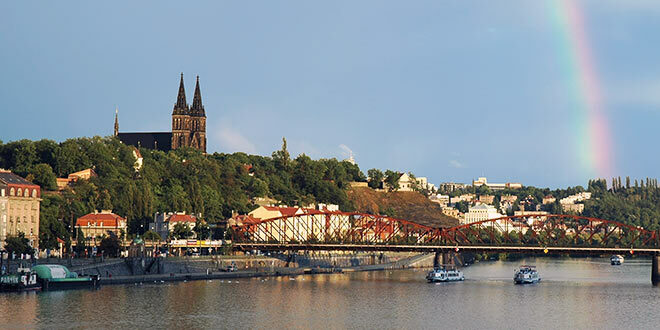 Vyšehrad is an alluring and pleasant walk lasting about 2 hours. Even though it is situated close to the city centre you will be in quiet surroundings out of traffic. Due to its position on a higher rock just above the Vltava river it offers nice panoramic views over part of Prague. The gardens surrounding Vyšehrad Church are peaceful and manicured for beauty. There are some nice views of the Vltava, a couple of restaurants to visit and some enormous statues depicting figures in Czech mythology to examine. Any time of day is a good time to visit. 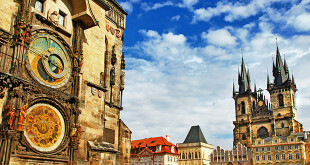 Take a morning off and bring a picnic lunch; few areas of Prague are as quiet, green and peaceful. Vyšehrad, sometimes referred to as ‘Prague’s second castle’, is another of the Czech Republic’s fine castles and was built in the 10th century on a hill over the Vltava river. Situated within the castle is the Church of St. Paul and St. Peter, as well as Vyšehrad Cemetery, containing the remains of many famous people from Czech history. The centrepiece is the Church of St. Peter and St. Paul, whose blackened shape stands grandly upon the hill overlooking the Vltava river and can be clearly seen from Prague Castle. Every inch of the interior is immaculately covered with decorations much like those on the pages of an illustrated manuscript, thus making it one of the most beautiful interiors in Prague. A small fee is required for this viewing pleasure. The Rotunda of St. Martin dating from the 11th century can be viewed a short distance from the church towards Vyšehrad Metro Station. It is one of the original rotundas of the city. How to get to Vyšehrad? It is easily and quickly reachable from the centre by metro line ‘C’ to station ‘Vyšehrad’ (two stations from the National Museum). From there it is about a 10-minute walk to Vyšehrad’s main gate. The tour of the complex takes about 2 or 3 hours. (open daily 9am-6 pm). Vyšehrad as Part of the History of Prague’s Fortifications (wheelchair accessible) – the entrance is from the Brick (Prague) Gate, giving access to Gorlice (wheelchair accessible, assistance recommended – uneven terrain) underground hall and the casemates, with six original Baroque statues from the Charles Bridge. In the reconstructed casemate space has been prepared the permanent exhibition ‘The Historic Faces of Vyšehrad’. The exhibition presents Vyšehrad in its various historical guises. This appealing site on the southern edge of the historic Prague Boroughs still retains its unique genius loci. The Rock over the Vltava, with the romantic ruins of the Baths of Libuše and the monumental double spires of the neo-Gothic church attract not only Praguers as visitors, but also visitors to Prague. After an unavoidable break, visitors will be able to learn more about the transformations of the area, its function and its place in time, on the spot. The permanent historical exhibition in the Brick Gate aims to present the development of Vyšehrad fortress in the context of the fortifications around Prague. 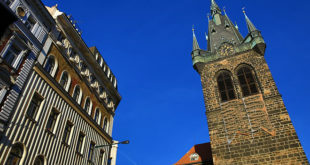 It was opened in 1993, and is a collaborative project with the City of Prague Museum and the Military Museum of the Czech Army’s Historical Institute. From the Brick Gate, narrow passages – casemates – lead through the ramparts. They run for a total distance of almost a kilometre, are a minimum of 2m high, and are about 1.5m wide. The casemates, entrance to which is possible on the right, not only lead to the exhibition entrance, but also open out into the monumental hall known as the Gorlice. This hall now serves as an exhibition space, and several of the original statues from Charles Bridge (replaced there by copies) now reside here. Gate built in 1655 and named after the town of Tabor in South Bohemia because the road leading there passed through the gate. Gothic gate with fragments of 14th-century town walls. Close to this gate is Jedlička Institute, the first institution for handicapped children in the Austro-Hungarian Empire which is still in operation today. Gate with a former moat is an entrance to the inner fortress. Information center in the Gothic Gate, from the time of Charles IV, located between the Tábor and Leopold’s Gates; information, souvenirs, publications on Vyšehrad, promotional materials, refreshment and restrooms. displayed art (graphic design exhibitions) depends on the time (this is not permanent one). The building is the remains of a Medieval watchtower, part of the fortifications of the Middle Ages. (Sts. Peter and Paul’s Basilica is wheelchair accessible). Open daily 8 am-6 pm. The burial site where over 600 prominent figures of Czech culture are buried, including: A. Dvořák, K. Čapek, B. Němcová, K. H. Mácha, J. Neruda, A. Mucha, M. Aleš, E. Destinnová, J. Heyrovský, B. Smetana, Z. Štěpánek. Because of their significance, the tombstones are typically sculptures made by other leading artists. The views of the Vlatava River and beyond from the top of here are stunning, the tombstones are a must see on anyones agenda beautiful, the statues from the Charles Bridge are amazing – tour guide explains all.